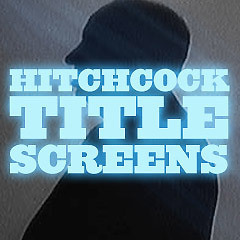 Movie Title Screens - Alfred Hitchcock Films: Title screens are the initial titles, usually projected at the beginning of a film, and following the logos of the film studio. They are often an ignored aspect of films, although they reflect the time period or era of the film, the mood or design of the film, and much more. English film-maker/director Alfred Hitchcock directed more than 50 feature films in a career spanning six decades. His first completed film was The Pleasure Garden (1925) about chorus girls in London. Other early, often-unseen silent works from 1925 to 1929 (known as the "Hitchcock 9") included the dark Downhill (1927), the thriller The Lodger (1927), a boxing love-triangle melodrama The Ring (1927), the rom-com melodrama Champagne (1928), Easy Virtue (1928), the comedy The Farmer's Wife (1928), Blackmail (1929), and the mature drama The Manxman (1929). Of his first 10 films, only 9 survive. He helped to shape the modern-day thriller genre, beginning with his early silent film The Lodger (1927), a suspenseful Jack-the-Ripper story, followed by his next thriller Blackmail (1929), his first sound film (but also released in a silent version) and the first "British talkie." However, his production of thrillers was spotty at first. Hitchcock would make a signature cameo appearance in his feature films, beginning with The Lodger (1927). After 1940, he appeared in every one, except for The Wrong Man (1956). He left England for Hollywood in 1939, where his first American film Rebecca (1940) won an Academy Award for Best Picture. He became known as "The Master of Suspense" for the taut thrillers and stories of suspense that he directed from the 1940s to the 1960s. He was recognized for his twist endings, signature themes of innocent men on the run, icy blondes, and use of decoys known as "MacGuffins."